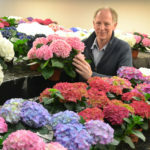 De Kwakel, March 2019 – Hydrangea Breeders Association (HBA) by definition supplies varieties that have a good shelf life. 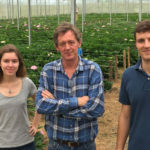 To fulfil this promise, keeping quality tests at one’s own location in De Kwakel are a fixed part of the selection procedure. Pot plant expert Jan ten Brinke opens the door to the test room. On long tables there is a variety of pot plant hydrangeas in all sorts of colors and shapes. A number of plants with umbels that look like they have been splashed with pink and white paint catch the eye. “Very special, yes,” says Ten Brinke. “And they keep fresh,” he says, examining. All plants have now been in the test room for three weeks that complies with the shelf life testing protocol. 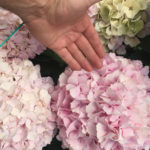 “That means that the hydrangeas here must stand for six weeks at 20⁰C under living room conditions,” Ten Brinke explains. 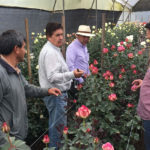 During the shelf life tests, the focus is on how the flower sticks, a secondary aspect is coloring. 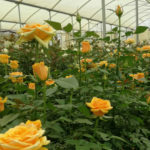 Cultivation properties such as even flowering, susceptibility to botrytis and beautiful leaves were looked at at an earlier stage during earlier clone trials. The pot plant specialist walks to a number of white hydrangeas. “Those are often sensitive types,” he knows. The flower edges of some varieties turn brown quickly, but the white with double flowers that Ten Brinke points out shows no brown coloring. ,, Look at what beautiful umbels they have. That looks promising. We already have a double light pink and a double light blue, but not a white one yet.